"Iron Man 3" only debuted in U.S. theaters last week, selling more than $175 million in tickets, but the film was already a hit around the world. The previous weekend's international opening grossed more than $195 million, or at least $10 million more than the global debut of "Marvel's The Avengers," which went on to become a $1.5 billion blockbuster. Tony Stark looks likely to fly past that figure: Sales have already hit $680.1 million worldwide. Impressed? You don't know the half of it. The 50-year-old Armored Avenger, who debuted in the March 1963 issue of "Tales of Suspense" as the brainchild of artists Don Heck and Jack Kirby and writers Stan Lee and Larry Lieber, Iron Man is showing signs of becoming as good or better a draw for Walt Disney (DIS) as Harry Potter was for Time Warner (TWX). (worldwide gross) More Impressive Feat? ($974.8 million) IM: Building a clean energy arc reactor from scraps in a cave? Score one for Shellhead. ($879.0 million) HP: Slays a monstrous basilisk, gets first glimpse of Voldemort. Way to man up, teenage Harry. ($796.7 million) IM: Deposits nuclear missile through portal in outer space, ending alien invasion. Expelliarmus that, Potter. ($307.7 million so far) "Harry Potter and the Goblet of Fire"
HP: Because, well, spoilers! And because Harry duels Voldemort in view of the Death Eaters. Spooky. IM: Sorry, Harry, but stopping an alien invasion trumps tangling with an angry wizard. To be fair, these totals are not adjusted for inflation. Had they been, Potter's numbers would have been demonstrably more impressive than what you see above. This is also a partial list. Harry Potter's cinematic adventures have not only made author J.K. Rowling rich, but as a group, they also represent the biggest film franchise in history, having generated more than $7.72 billion in global box office receipts over eight movies. Yet, of the two, Iron Man seems to be the more impactful character. This once second-tier superhero was largely unknown to the general public before 2008. Now, he's selling out premium showings around the globe. IMAX (IMAX) says "Iron Man 3" grossed $7.1 million from 113 IMAX theaters internationally during the film's end-of-April opening weekend overseas. And the May 1 premiere in mainland China set a new opening day record for the company, raking in $1.8 million in 101 theaters. For Disney and subsidiary Marvel Studios, "Iron Man 3" also kicks off "Phase 2" of what's known as the Marvel Cinematic Universe. 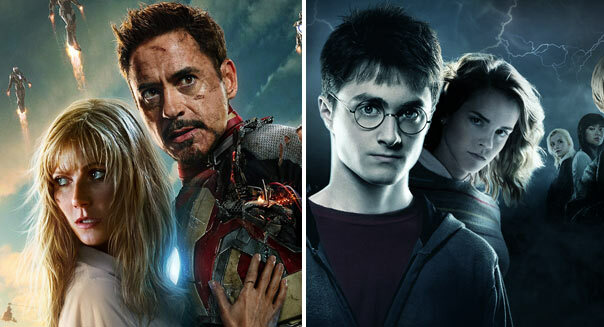 Executives are stringing together films as if they were an on-screen comic book series, which means Iron Man could still be repulsor-blasting baddies when Harry Potter is a distant memory. "Phase 1" marked the first step in realizing that vision, culminating with "The Avengers." As a franchise, the six "Phase 1" films grossed $4.109 billion worldwide, according to Box Office Mojo. 1. "Iron Man 3" (May 2013). Tony Stark faces off against the mysterious Mandarin, one of his oldest and most infamous foes from the comics. 2. "Thor: The Dark World" (November 2013). The Norse god of thunder teams with his subversive adopted brother, Loki, in facing off against an ancient enemy. 3. "Captain America: The Winter Soldier" (April 2014). Based on a popular offshoot of the mainline Captain America comic book. The film teams the star-spangled hero with Scarlett Johansson's Black Widow from "The Avengers." 4. "Guardians of the Galaxy" (August 2014). A big-space epic filled with aliens and endless possibility. If done well, it could succeed where Warner's "Green Lantern" failed. 5. "The Avengers 2" (May 2015). Sequel to the biggest film of last summer, and sure to introduce at least one new character to kick off another phase of Marvel films. Will this collection of gods, monsters, aliens, and heroes match up to the magic of Hogwarts? Thanks to the record-setting start of "Iron Man 3," Disney and Marvel seem poised to do that and more. Motley Fool contributor Tim Beyers owns shares of Walt Disney and Time Warner. The Motley Fool recommends IMAX and Walt Disney. The Motley Fool owns shares of IMAX and Walt Disney. Try any of our newsletter services free for 30 days.